We started with drinks, while we browsed over the menu. They had a lot of local beers on tap, which I always like to see. I ordered a Pizza Port IPA and my husband got a Gin & Tonic. 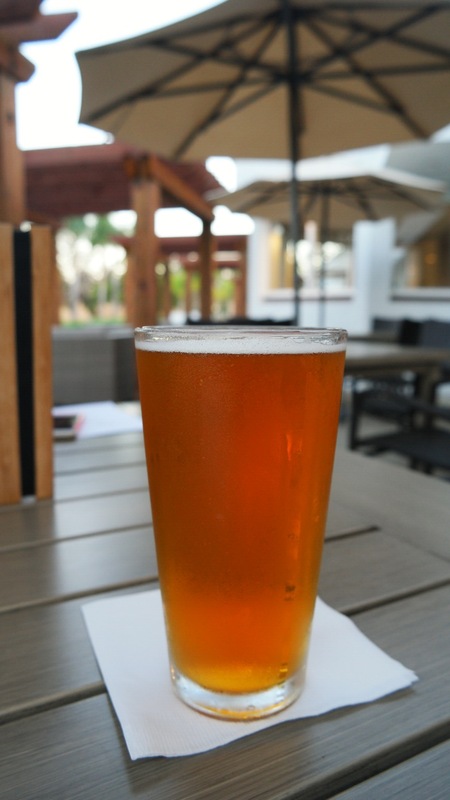 Our server brought me out his favorite Pizza Port beer to sample, which I thought was really nice of him. My 13 year old has been wanting to expand his palate for seafood, and when he saw fried calamari on the Small Bites menu he asked if we could order that. Some of the other Small Bites, Soups & Salads Asado Grill offered were crab cakes, caprese salad, wedge salad, and Lobster Bisque. We loved the calamari! The breading was so light and crispy. It was lightly coated with a sweet chili glaze and Asado aioli on the side for dip. 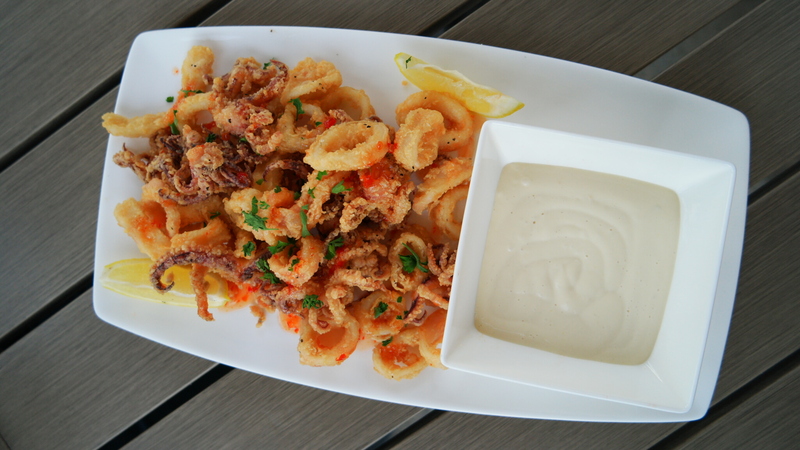 The calamari melted in your mouth! Asado Grill had so much to choose from as far as Entrees go. They had signature dishes categorized by Sea, Land, From the Grill and Burgers & Sandwiches. Our server gave us a couple of recommendations, which I always appreciate. 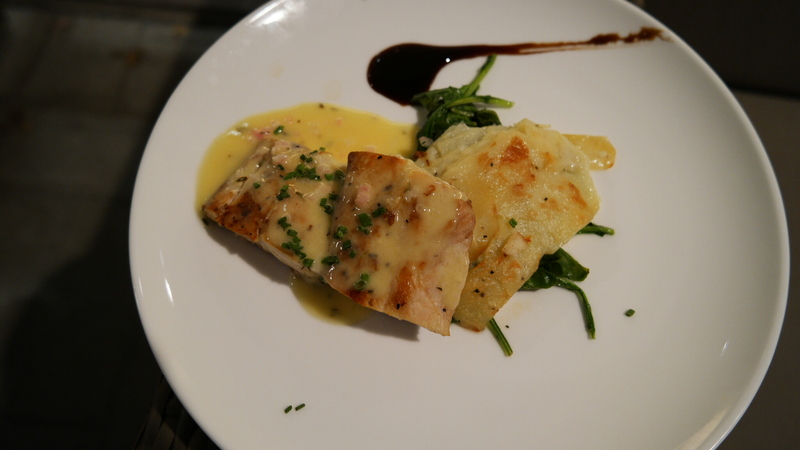 I ordered the White Sea Bass, it was pan seared with citrus herb butter sauce served with the restaurant’s signature au gratin potatoes and wilted spinach. The sea bass was seared perfectly and was so tender. The citrus herb butter was really creamy and complimented the fish well. I enjoyed the au gratin potatoes with the fish, they had a crispy outer crust and were soft on the inside. 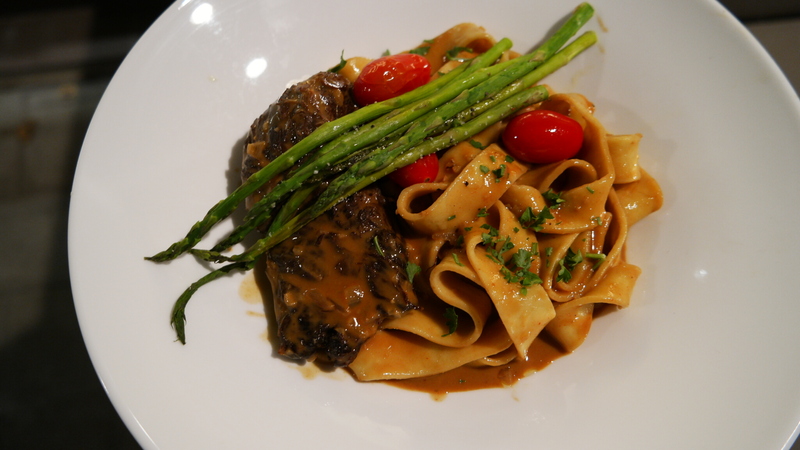 My husband ordered the Napa Valley Beef Short Ribs with cabernet sauce, pappardelle pasta, cherry tomatoes and asparagus. The short ribs were so tender to the touch, no knives needed with this dish! The pappardelle pasta was cooked al dente. The entire dish was covered in the cabernet sauce, which was rich and so flavorful. I was so tempted to lick the plate. 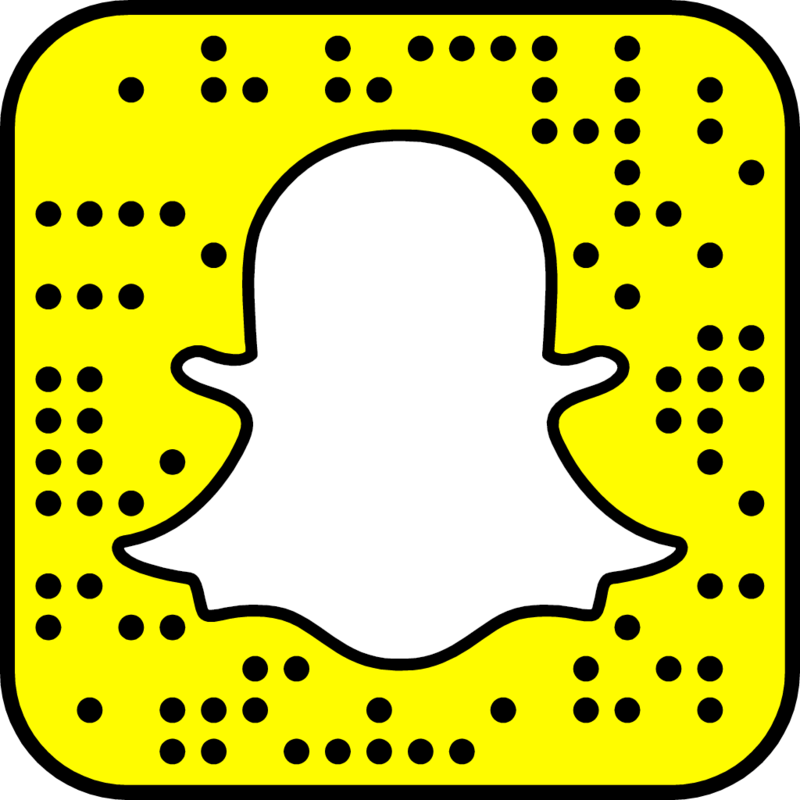 Kidding (not kidding)! My oldest son had a cheeseburger with French fries and my youngest son had macaroni and cheese from the kids menu. Everyone was happy with their dinner picks. After dinner, we could see the movie on the lawn being queued up in the distance and blankets placed on the grass for viewing from. The movie that evening was Disney’s Zootopia. Being a Disney family, we were very excited, especially since we like Zootopia. Our server said he was sending us off with dessert to-go to enjoy with the movie. Yay! The dessert was fantastic! 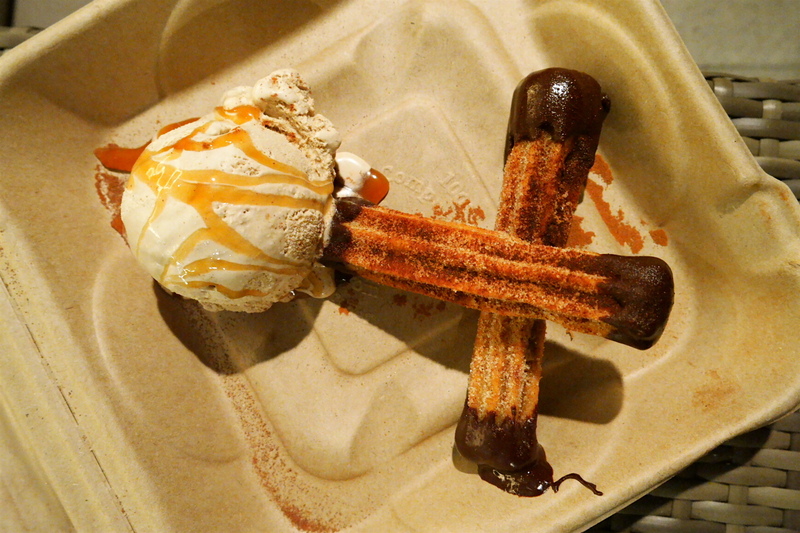 It was caramel-filled churros with chocolate ganache, Dulce de Leche ice cream, and a caramel drizzle. The crispy churros softened the ice cream into a soft serve consistency. The ganache was a wonderful addition of sweetness. Lucky for me, I only had to share with one of my family members. I would return especially for this dessert! I didn’t get to check out a room, but from the pictures I saw on Hotel Karlan’s website, I would not mind having a staycation there. The rooms offer plenty of natural light and soothing colors, that look very relaxing. 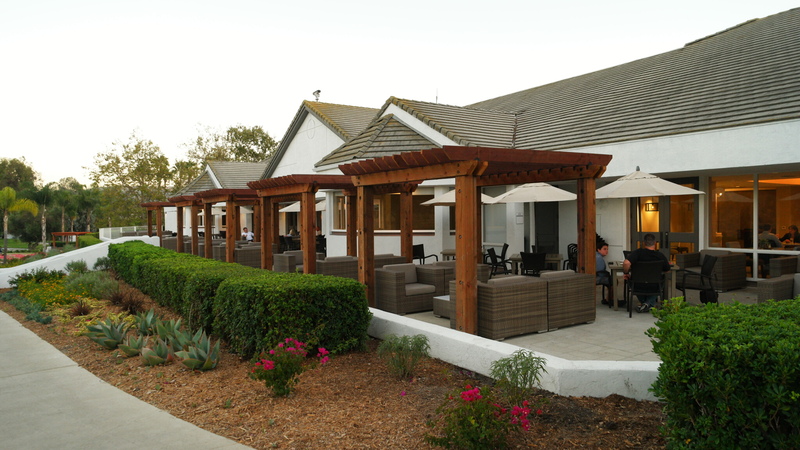 The rooms have their own private balcony or patio with views of their pool or garden. 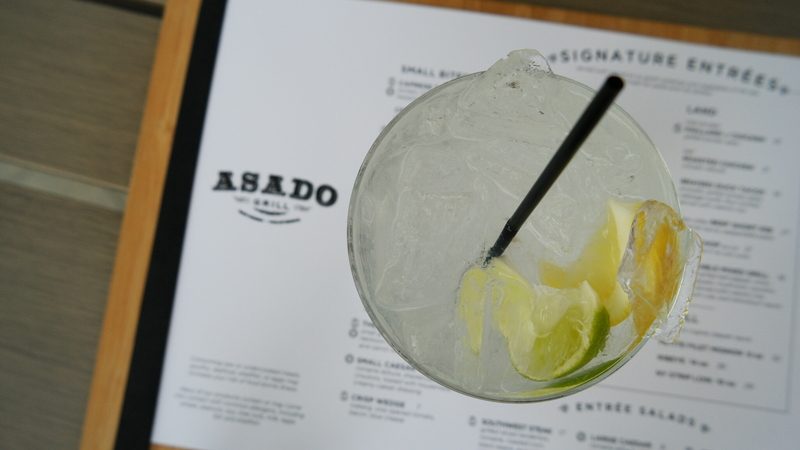 In addition to dinner, Asado Grill also serves breakfast and lunch.